Photo Credit: Anomalous_A at Flickr (Click to view his full photostream.) Number 56 is on the right (with the window open), second floor from the top. 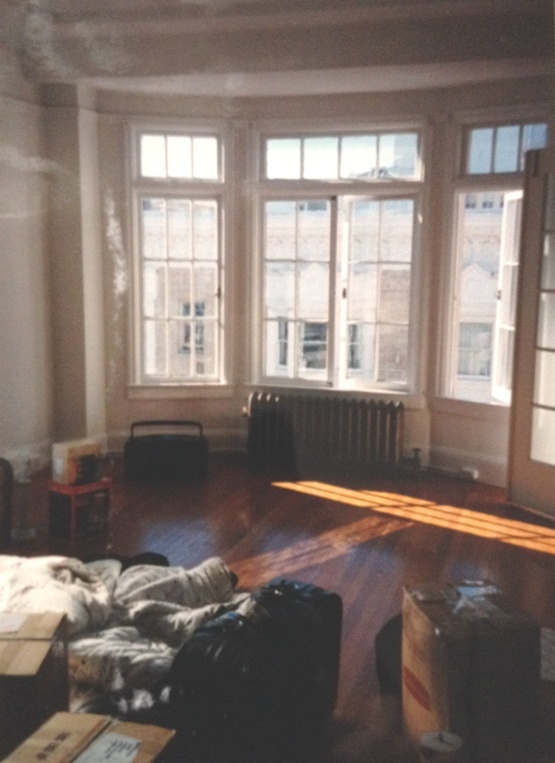 I moved to San Francisco at the end of 1996. I had been living in Reno, Nevada for two years and was itching to get out of its eerie strangeness (if you’ve ever been for an extended amount of time, you know what I’m talking about). I worked as Publishing Coordinator for Addi Galleries’ publishing division (limited edition fine art prints). 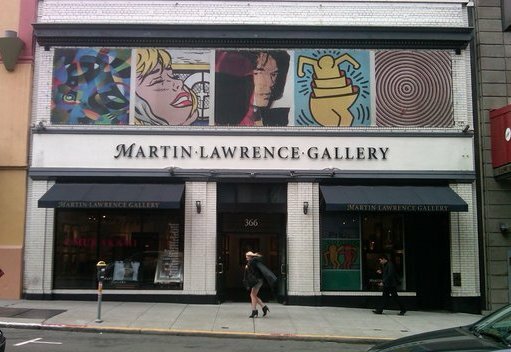 When they announced that a new location (now occupied by the Martin Lawrence Gallery) was being built in Union Square, I jumped at the chance to relocate as the new gallery’s Administrative Director (for a cool $13 per hour). In one extended weekend, I set out to find my new apartment. My whirlwind search was a success (reminder there was no Craigslist yet); the rental agreement 820 Jones Street, #56 was signed at the end of my trip. The ad in the paper (the paper!) 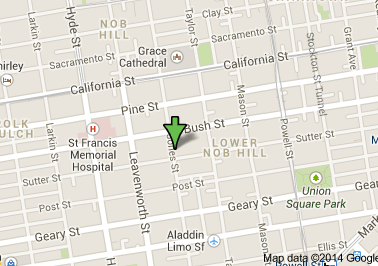 said the apartment was in Nob Hill, but some would say it was really in the Tenderloin. I think technically it’s Lower Nob Hill, (“Tendernob” came into use in the early 2000s, a term I’ve never liked nor used), but I always told people I lived in Union Square, as it was a short three and a half block walk to the actual Square. I had the corner unit, so I could see across the street to Sutter. 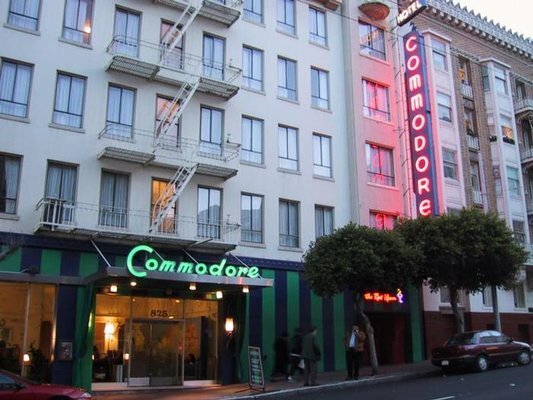 Back then, the Commodore Hotel (now a residence hall for the Academy of Art) ruled the block, with its popular Red Room nightclub (all red decor, as one would guess). The Commodore Hotel. Photo credit: Phil H. via Yelp. Next door to the Commodore was the Titanic Cafe (now the Cafe Bean), a small diner that served breakfast and lunch only. Sometimes on weekend mornings I would sit at the bar and treat myself to a their buttermilk griddlecakes for $5.75. It was the first time I saw the sign, “Tipping is not a city in China”. My first few days in the apartment were spent trying to keep warm (one of the windows didn’t shut and my radiator was jenky) and to function on very little sleep. I didn’t yet have a futon; I slept on a bed made of my bathrobe and towels, and used my comforter for covering (why did no one tell me about heating blankets!? I would have bought one in two seconds!). I also didn’t have curtains for I can’t remember how long. I arrived during the week between Christmas and New Years, so the city was even louder than usual and had a weird energy that made me uneasy. On New Year’s Eve, the the town went wild with people yelling, honking car horns and throwing calendars out windows (a tradition that has since stopped). The inside of 820 Jones Street #56 on move-in day. 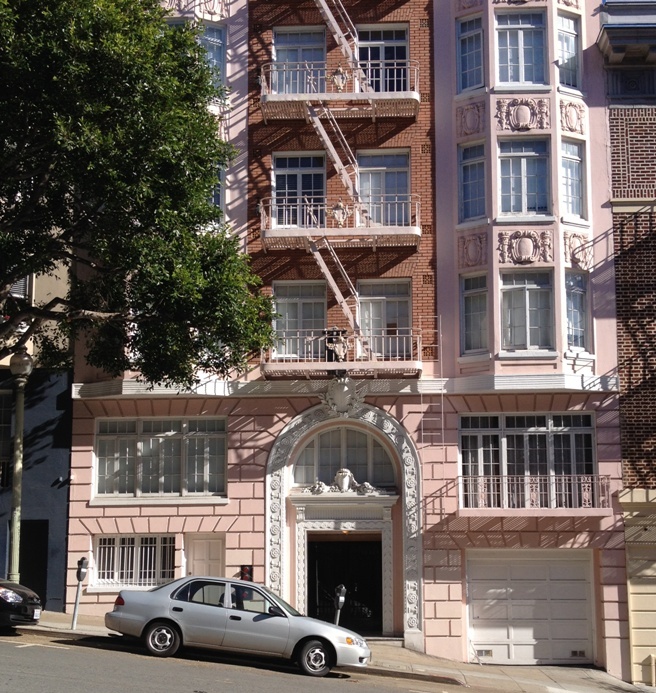 Coincidentally, 820 Jones was also my third San Francisco apartment. In 2000 I lived at #51 for about five months. This was during the dot-com boom and the rent was up to $1100. I saw an online ad dated October 2013 for a 3rd-floor unit. The rent was $1895. I drove by it the other day on the way to get my hair cut. I pulled over and got out to take a couple photos and say goodbye. I had forgotten it was painted my favorite shade of pink – a realization that made me suddenly so happy. I smiled all the way back to my car. This entry was posted in Life, Musings, Places, Restaurants, San Francisco and tagged 1990s, Apartments, Art Gallery, Buildings, Cold, First Apartment, Geary Street, Hotels, Jones Street, Moving, New Years, New Years Eve, Nob Hill, Pink, Rent, Rental, Roaches, San Francisco, Saying Goodbye, Sutter Street, Tenderloin, Travel, Union Square. Bookmark the permalink. 820 Jones holds a special place in my heart. It was my first apt on my own 3000 miles from home in Florida. This was 1983, and my rent was I think around $475. I remember walking down Sutter to work in Union Square (Saks) sporting my Nike sneakers carrying heals in a shopping bag…like Working Girl…lots of fond memories. 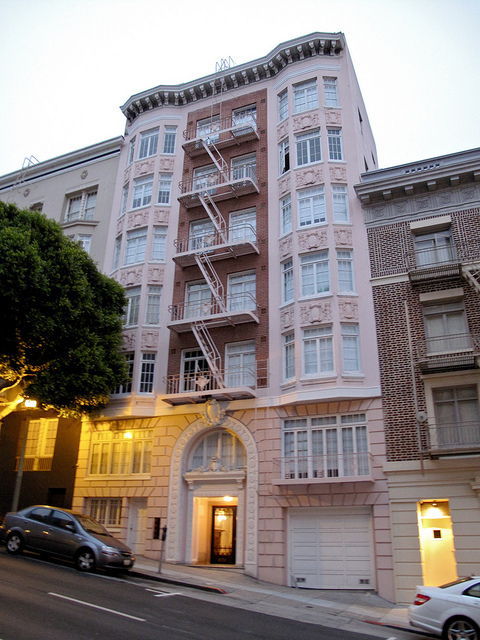 My studio was high up in the rear of the building and I could see the flag waving atop Nob Hill, the Mark Hopkins. Looking over at the other buildings and windows of the Canterbury (Greenhouse restaurant) behind our building reminded me of Rear Window…love Alfed Hitchcock, and Vertigo. Walking down to the White Horse was my local. I remember Henry Africa’s and Norman Hobday…I was his head gal for awhile…and friends with Carter and Kent…Balboa Cafe was his brother’s place at the time…Slick. I loved the color pink and 820 Jones was pink then…and I was in the pink living there. God Bless. Oh my goodness! That’s fantastic. Thank you so much for sharing your story and your time there. The White Horse! The Balboa Cafe! I miss those places. I feel the same. My first time being really alone and on my own in the big city, walking to my job in Union Square. Be well! I can’t believe I found this post. I lived in the same Apartment a year or so before you did. You probably ended up with some of my mail. Remember the Bay View from the shower? I really loved that place. Oh, when I moved in the rent was $650, probably about 1993. How funny! I love that, so great. Crazy to think how “cheap” it was back then. My, how time flies. I remember driving you around the City back in 1996 like it was yesterday. Best of luck on your new adventure in Michigan! Thanks for stopping by the blog! I’m so glad you were part of some of my first San Francisco memories. Michigan will be very different, but hopefully just as great. I remember Red Room! One of the first places I went to “regularly” (well like 3 or 4 times?) the first year I was in SF – I also arrived in Fall 1996. Wish we would have known each other then. I was lonely the first couple years. Very awesome to be on my own exploring but…would have been better with a Cecily. That’s soooo nice of you. You’re the best!